Until then, I've found a Web site that's pretty good at soothing the savage beast. 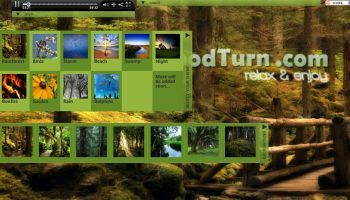 It's called MoodTurn, and it plays relaxing, New Age-y music mixed with the sounds of nature--at the same time treating you to a peaceful nature scene. In no time at all, you'll be down from the clock tower and surrendering your rifle to the authorities. The site's controls might seem a tad confusing at first. Start by clicking the Player menu up top, then click Select Your Theme to choose between 10 lovely soundscapes: Birds, Beach, Bonfire, Storm, and and so on. You can also click Background and choose from lovely landscapes that match your selected theme. But these steps are optional: MoodTurn will automatically cycle the images and music without any input from you.